The promotion period: Thursday 14th December 2017 – Sunday 11th February 2018. 2. The promoter is Auckland Auto Collection Limited (trading as John Andrew Ford) (Company Registration # 939375) of 2 Great North Road, Grey Lynn, Auckland, 1021. 3. The promotion period commences in NZ at 8.00am on 14th December 2017 and closes at 5.00pm on 11th February 2018. 4. Entry is only open to retail customers who fulfill the entry requirements (as outlined in point 5). Employees, directors, management, licensees and contractors of the promoter or its related bodies and advertising agencies are ineligible to enter. 5. 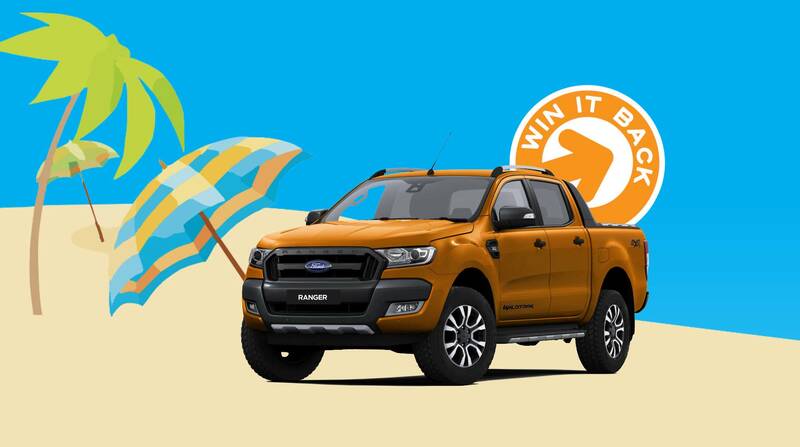 To enter the promotion, entrants must: a)During the promotional period:i.Service their vehicle as per their manufacturer service schedule, at John Andrew Ford’s Grey Lynn Service Centre. ii.Complete an entry form, including invoice number of service. iii.Paid the service invoice in full to John Andrew Ford. 6.Valid entries will be put into a barrel and the winner will be drawn out at random. 7.The winning entry will be the first entry form pulled out of the barrel. In the event that the first entry form is not deemed eligible to win (due to false, incorrect or incomplete details, or not fulfilling the entry requirements as outlined in point 5) a second entry form will be pulled out. This will continue until a winning entry is found. The draw will take place at 2pm on Wednesday 14th February 2018 at John Andrew Ford, 2 Great North Road, Grey Lynn, Auckland. 8.Only one (1) entry is permitted per customer per vehicle serviced within the promotional period. 9.The winner will be notified by phone within two (2) business days of the draw. The winners name may also be published on the John Andrew Ford Facebook page, and/or on their websites. The promoter’s decision is final and no correspondence will be entered into. 10.The prize consists of:i.Total refund of the winners service invoice, up to the value of $1,000 including GST. 11.Incomplete, indecipherable or illegible entries will be deemed invalid. No responsibility will be accepted for lost, illegible or misdirected entries. 12.The promoter reserves the right, at any time, to verify the validity of entries and entrants (including the entrants’ identity, age and place of residence) and to disqualify any entrant who submits an entry that is not in accordance with the terms and conditions or who tampers with the entry process. Errors and omissions may be accepted at the promoter’s discretion. Failure by the promoter to enforce any of its rights at any stage does not constitute a waiver of those rights. 13.If there is a dispute as to the identity of the entrant, the promoter reserves the right, in its sole discretion, to determine the identity of the entrant. 14.If the prize is not claimed, or the winner is not contactable, within 40 days of the draw, the prize will be deemed forfeited. 15.Entry into the promotion is deemed as approval to use the winner’s name(s) and photograph(s) for publicity purposes. Entrants consent to the Promoter using their name, likeliness, image and/or voice in the event they are a winner (including photograph, film and/or recording of the same) in any media for an unlimited period without remuneration for the purpose of promoting this promotion (including the outcome), and promoting any products and/or services supplied by the promoter. 16.If this promotion is interfered with in any way or is not capable of being conducted as reasonably anticipated due to any reason beyond the reasonable control of the promoter, including but not limited to technical difficulties, unauthorized intervention or fraud, the promoter reserves the right, in its sole discretion, to the fullest extent permitted by law: (a) to disqualify any entrant; or (b) subject to any written directions form regulatory authority, to modify, suspend, terminate or cancel the promotion, as appropriate. 17.Nothing in these terms and conditions limits excludes or modifies or purports to limit, exclude or modify the statutory consumer guarantees as provided under the Consumer Guarantees Act, as well as any similar consumer protection laws in New Zealand. 18.Except for any liability that cannot by law be excluded, including non-excludable Guarantees, the promoter (including its respective officers, employees and agents) excludes all liability (including negligence), for any personal injury; or any loss or damage (including loss of opportunity); whether direct, indirect, special or consequential, arising in any way out of: (a) any technical difficulties or equipment malfunction (whether or not under the promoter’s control); (b) any theft, unauthorized access or third party interference; (c) any entry or prize claim that is late, lost, altered, damaged or misdirected (whether or not after their receipt by the promoter) due to any reason beyond the reasonable control of the promoter; (d) any variation in prize value to the stated in these terms and conditions; (e) any tax liability incurred by a winner or entrant; or (f) use of a prize. 20.All entries become the property of the promoter.